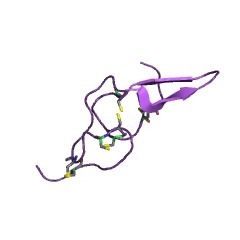 The domain within your query sequence starts at position 426 and ends at position 501; the E-value for the DISIN domain shown below is 9.7e-41. 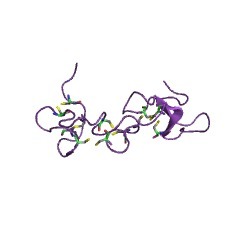 Snake disintegrins inhibit the binding of ligands to integrin receptors. 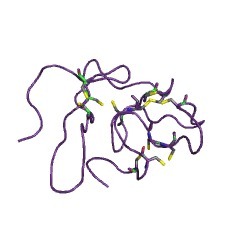 They contain a 'RGD' sequence, identical to the recognition site of many adhesion proteins. 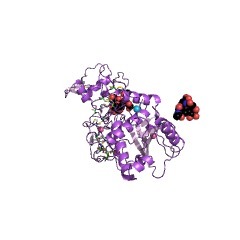 Molecules containing both disintegrin and metalloprotease domains are known as ADAMs. 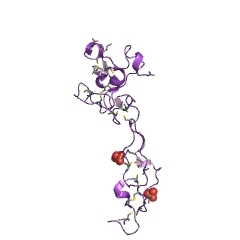 Disintegrins are a family of small proteins from viper venoms that function as potent inhibitors of both platelet aggregation and integrin-dependent cell adhesion [(PUBMED:15578957), (PUBMED:15974889)]. 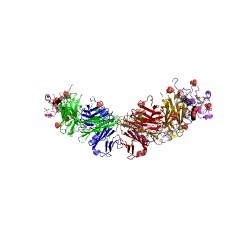 Integrin receptors are involved in cell-cell and cell-extracellular matrix interactions, serving as the final common pathway leading to aggregation via formation of platelet-platelet bridges, which are essential in thrombosis and haemostasis. 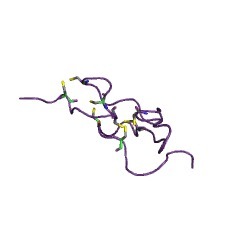 Disintegrins contain an RGD (Arg-Gly-Asp) or KGD (Lys-Gly-Asp) sequence motif that binds specifically to integrin IIb-IIIa receptors on the platelet surface, thereby blocking the binding of fibrinogen to the receptor-glycoprotein complex of activated platelets. Disintegrins act as receptor antagonists, inhibiting aggregation induced by ADP, thrombin, platelet-activating factor and collagen [(PUBMED:12050803)]. The role of disintegrin in preventing blood coagulation renders it of medical interest, particularly with regard to its use as an anti-coagulant [(PUBMED:16918409)]. Disintegrins from different snake species have been characterised: albolabrin, applagin, barbourin, batroxostatin, bitistatin, obtustatin [(PUBMED:12742023)], schistatin [(PUBMED:16101289)], echistatin [(PUBMED:15535803)], elegantin, eristicophin, flavoridin [(PUBMED:14499613)], halysin, kistrin, tergeminin, salmosin [(PUBMED:14661951)] and triflavin. 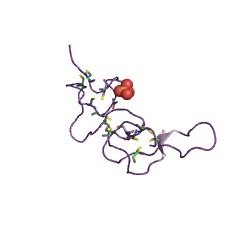 Some snake venom zinc metalloproteinases [(PUBMED:15962120)] consist of an N-terminal catalytic domain fused to a disintegrin domain. 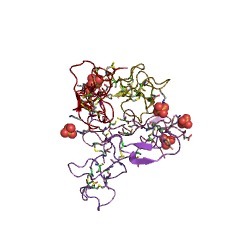 Such is the case for trimerelysin I (HR1B), atrolysin-e (Ht-e) and trigramin. 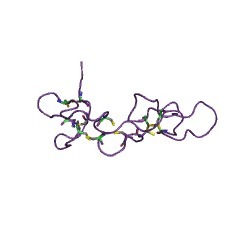 It has been suggested that these proteinases are able to cleave themselves from the disintegrin domains and that the latter may arise from such a post-translational processing. 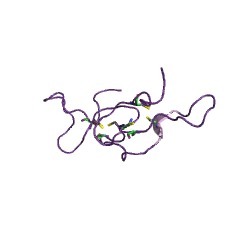 The beta-subunit of guinea pig sperm surface protein PH30 [(PUBMED:1552944)]. 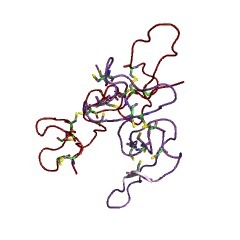 PH30 is a protein involved in sperm-egg fusion. 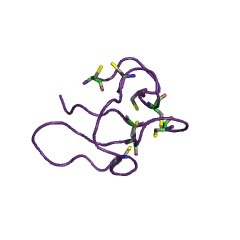 The beta subunit contains a disintegrin at the N-terminal extremity. 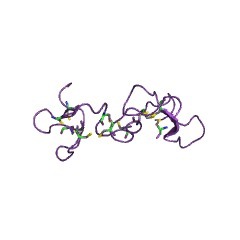 Mammalian epididymial apical protein 1 (EAP I) [(PUBMED:1417724)]. 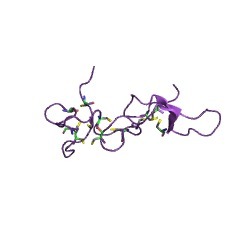 EAP I is associated with the sperm membrane and may play a role in sperm maturation. 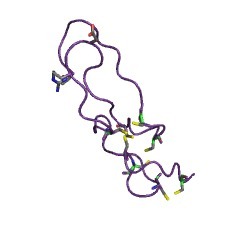 Structurally, EAP I consists of an N-terminal domain, followed by a zinc metalloproteinase domain, a disintegrin domain, and a large C-terminal domain that contains a transmembrane region. 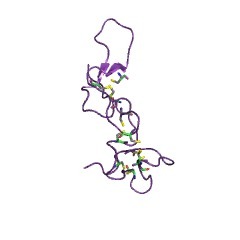 There are 12250 DISIN domains in 12145 proteins in SMART's nrdb database. Taxonomic distribution of proteins containing DISIN domain. This tree includes only several representative species. The complete taxonomic breakdown of all proteins with DISIN domain is also avaliable. Click on the protein counts, or double click on taxonomic names to display all proteins containing DISIN domain in the selected taxonomic class. 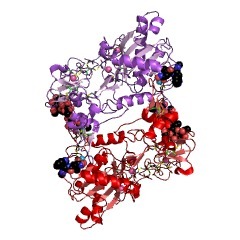 Mammalian cells proteolytically release (shed) the extracellular domains of many cell-surface proteins. Modification of the cell surface in this way can alter the cell's responsiveness to its environment and release potent soluble regulatory factors. The release of soluble tumour-necrosis factor-alpha (TNF-alpha) from its membrane-bound precursor is one of the most intensively studied shedding events because this inflammatory cytokine is so physiologically important. 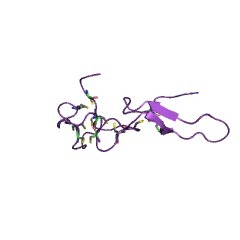 The inhibition of TNF-alpha release (and many other shedding phenomena) by hydroxamic acid-based inhibitors indicates that one or more metalloproteinases is involved. 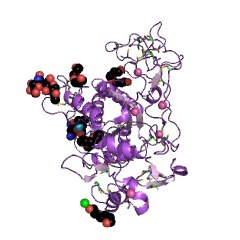 We have now purified and cloned a metalloproteinase that specifically cleaves precursor TNF-alpha. 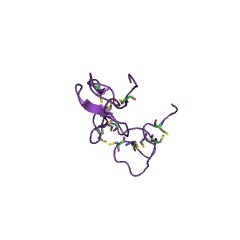 Inactivation of the gene in mouse cells caused a marked decrease in soluble TNF-alpha production. 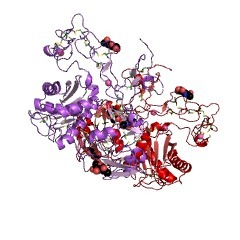 This enzyme (called the TNF-alpha-converting enzyme, or TACE) is a new member of the family of mammalian adamalysins (or ADAMs), for which no physiological catalytic function has previously been identified. 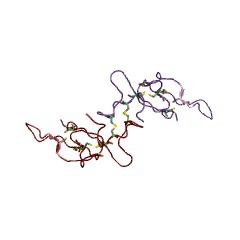 Our results should facilitate the development of therapeutically useful inhibitors of TNF-alpha release, and they indicate that an important function of adamalysins may be to shed cell-surface proteins. 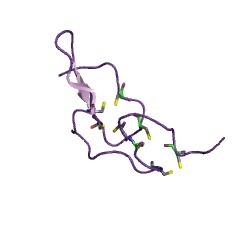 Rotavirus contains integrin ligand sequences and a disintegrin-like domain that are implicated in virus entry into cells. Rotavirus contains two outer capsid viral proteins, the spike protein VP4 and major capsid component VP7, both of which are implicated in cell entry. 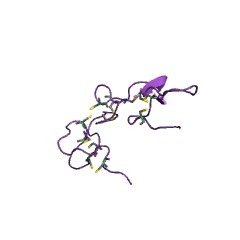 We show that VP4 and VP7 contain tripeptide sequences previously shown to act as recognition sites for integrins in extracellular matrix proteins. 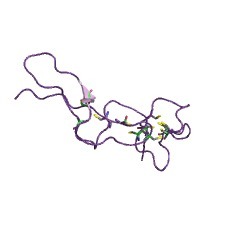 VP4 contains the alpha2beta1 integrin ligand site DGE. 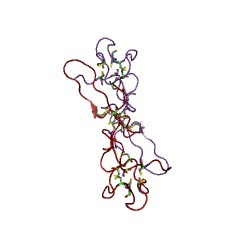 In VP7, the alphaxbeta2 integrin ligand site GPR and the alpha4beta1 integrin ligand site LDV are embedded in a novel disintegrin-like domain that also shows sequence similarity to fibronectin and the tie receptor tyrosine kinase. Microorganism sequence homology to these ligand motifs and to disintegrins has not been reported previously. 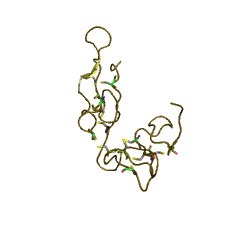 In our experiments, peptides including these rotaviral tripeptides and mAbs directed to these integrins specifically blocked rotavirus infection of cells shown to express alpha2beta1 and beta2 integrins. 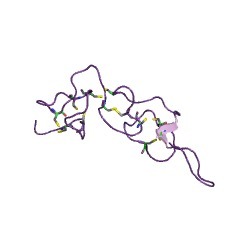 Rotavirus VP4-mediated cell entry may involve the alpha2beta1 integrin, whereas VP7 appears to interact with alphaxbeta2 and alpha4beta1 integrins. Cloning of a disintegrin metalloproteinase that processes precursor tumour-necrosis factor-alpha. 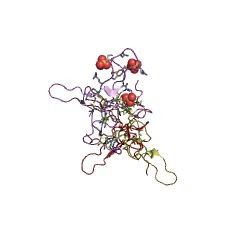 Tumour-necrosis factor-alpha (TNF-alpha) is a cytokine that contributes to a variety of inflammatory disease states. 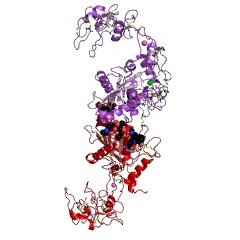 The protein exists as a membrane-bound precursor of relative molecular mass 26K which can be processed by a TNF-alpha-converting enzyme (TACE), to generate secreted 17K mature TNF-alpha. We have purified TACE and cloned its complementary DNA. 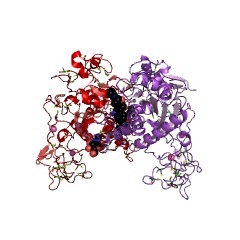 TACE is a membrane-bound disintegrin metalloproteinase. Structural comparisons with other disintegrin-containing enzymes indicate that TACE is unique, with noteable sequence identity to MADM, an enzyme implicated in myelin degradation, and to KUZ, a Drosophila homologue of MADM important for neuronal development. 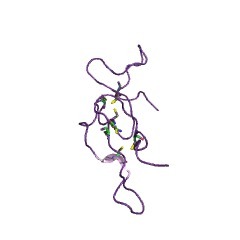 The expression of recombinant TACE (rTACE) results in the production of functional enzyme that correctly processes precursor TNF-alpha to the mature form. 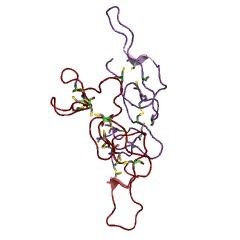 The rTACE provides a readily available source of enzyme to help in the search for new anti-inflammatory agents that target the final processing stage of TNF-alpha production. Kuzbanian controls proteolytic processing of Notch and mediates lateral inhibition during Drosophila and vertebrate neurogenesis. Notch and the disintegrin metalloprotease encoded by the kuzbanian (kuz) gene are both required for a lateral inhibition process during Drosophila neurogenesis. 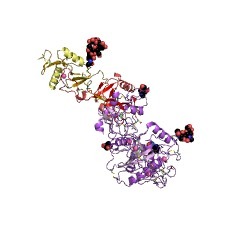 We show that a mutant KUZ protein lacking protease activity acts as a dominant-negative form in Drosophila. Expression of such a dominant-negative KUZ protein can perturb lateral inhibition in Xenopus, leading to the overproduction of primary neurons. This suggests an evolutionarily conserved role for KUZ. The Notch family of receptors are known to be processed into smaller forms under normal physiological conditions. 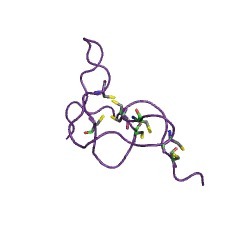 We provide genetic and biochemical evidence that Notch is an in vivo substrate for the KUZ protease, and that this cleavage may be part of the normal biosynthesis of functional Notch proteins. 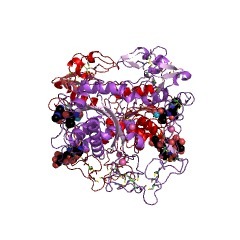 Members of the ADAM family (membrane proteins with a disintegrin and metalloprotease domain) have been implicated in several cell-interactive events, including cell-cell fusion. 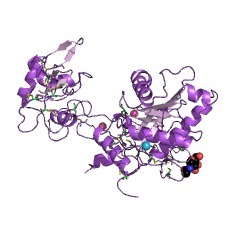 Recent evidence implicates three ADAMs, fertilin-alpha, fertilin-beta, and meltrin-alpha, in sperm-egg fusion and myoblast fusion. In light of the large number and wide tissue distribution of the ADAMs, they may also participate in other cell-cell fusion events. As ADAMs are also found in both vertebrates and invertebrates, some features of cell-cell fusion reactions may be conserved throughout the animal kingdom. KUZ, a conserved metalloprotease-disintegrin protein with two roles in Drosophila neurogenesis. During neurogenesis in Drosophila both neurons and nonneuronal cells are produced from a population of initially equivalent cells. The kuzbanian (kuz) gene described here is essential for the partitioning of neural and nonneuronal cells during development of both the central and peripheral nervous systems in Drosophila. Mosaic analyses indicated that kuz is required for cells to receive signals inhibiting the neural fate. These analyses further revealed that the development of a neuron requires a kuz-mediated positive signal from neighboring cells. The kuz gene encodes a metalloprotease-disintegrin protein with a highly conserved bovine homolog, raising the possibility that kuz homologs may act in similar processes during mammalian neurogenesis. 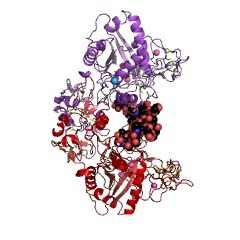 Structure, function and evolutionary relationship of proteins containing a disintegrin domain. 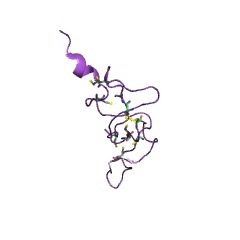 Disintegrins are soluble integrin ligands from snake venoms that disrupt cell-matrix interactions. 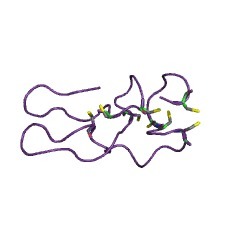 Recently, the nuclear magnetic resonance structures of two disintegrins were determined, providing provocative molecular insight into how a disintegrin may engage an integrin. 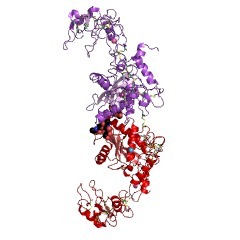 In addition, it has recently been realized that disintegrins are derived from larger multifunctional proteins, and that there is a family of membrane-anchored, disintegrin domain-containing proteins that may promote important cell-cell interactions. This information is based on mapping of SMART genomic protein database to KEGG orthologous groups. Percentage points are related to the number of proteins with DISIN domain which could be assigned to a KEGG orthologous group, and not all proteins containing DISIN domain. Please note that proteins can be included in multiple pathways, ie. the numbers above will not always add up to 100%. 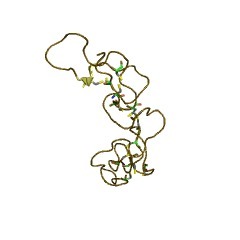 1tej Crystal structure of a disintegrin heterodimer at 1.9 A resolution.